❡ Benefits Good for Relaxation, Cardiac disorder, Diabetes. Enhancing body condition, Menopause. Increase appetite. Low cholesterol, Anemia, Insomnia. With this product, you earn 24 Reward point(s). 24 points = $0.24. What is perilla leaf? What is it used for? The perilla is a purplish plant that grows throughout east Asia, especially in the hills and mountains of China and Japan. It can reach a height of approximately two feet, with scented flowers that bloom in July and August. Different parts of the perilla are used for different conditions. This article discusses the use of perilla stem; perilla seed and perilla leaf are discussed elsewhere. 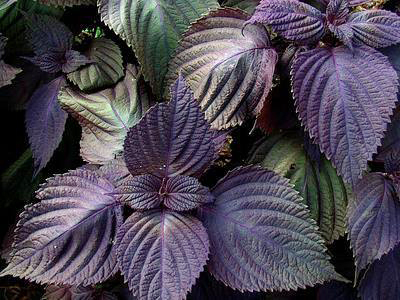 Perilla leaves are spade-shaped and ridged, and range in color from dark green to purple. Like the stems, perilla leaves are harvested in the summer and autumn, and allowed to dry in the air before being used in herbal remedies. How much perilla leaf should I take? The typical dosage of perilla leaf is between 3 and 12 grams, decocted in water. When creating a decoction, perilla leaves should be boiled no longer than 10 minutes. What forms of perilla leaf are available? Crushed, dried perilla leaf can be found at many herbal shops, Asian markets and specialty stores. Powdered perilla leaf is also available in some locations. What can happen if I take too much perilla leaf? Are there any interactions I should be aware of? What precautions should I take? As of this writing, there are no known side-effects from taking large doses of perilla leaf, nor are there any known drug interactions. Women who are pregnant should use perilla leaf only under a health care provider's supervision. As always, make sure to consult with a licensed health care practitioner before taking perilla leaf or any other herbal remedy or dietary supplement. Ihara M, Umekawa H, Takahashi T, et al. Comparative effects of short- and long-term feeding of safflower oil and perilla oil on lipid metabolism in rats. Comp Biochem Physiol B Biochem Mol Biol October 1998;121(2):223-31. Nagatsu A, Tenmaru K, Matsuura H, et al. Novel antioxidants from roasted perilla seed. Chem Pharm Bull (Tokyo) May 1995;43(5):887-9. Narisawa T, Fukaura Y, Yazawa K, et al. Colon cancer prevention with a small amount of dietary perilla oil high in alpha-linolenic acid in an animal model. Cancer April 15, 1994;73(8):2069-75. Okuno M, Kajiwara K, Imai S, et al. Perilla oil prevents the excessive growth of visceral adipose tissue in rats by down-regulating adipocyte differentiation. J Nutr September 1997;127(9):1752-7. Suzuki H, Ishigaki A, Hara Y. Long-term effect of a trace amount of tea catechins with perilla oil on the plasma lipids in mice. Int J Vitam Nutr Res 1998;68(4):272-4. Wash 20g of herb on running water; boil for over 2hours depending on symptom in 2L of water.